- We will recommend speedtalk in the US. - If the GPS Kids watch does not work properly / the device is offline, check if the correct area is selected when registering for the first time. And contact the seller directly, I will try my best to help you. - When you insert the SIM card, you need to turn off the watch.  Precise GPS Positioning System: True GPS, GPS will provide more accurately location than LBS when kids are outdoor, the error will be less than 100feet (30meters). Realize all-day real-time location tracking, more accurate positioning, children just click right button to connect the phone, At the same time, parents can check the location anytime, anywhere by SMS, website, IOS or Android APP.  SOS Emergency Call Feature: Press SOS key for 3 seconds in any model. Parents can setting three numbers for SOS emergency call, it will call 3 SOS phone numbers alternatively in 2 rounds until answering the call. 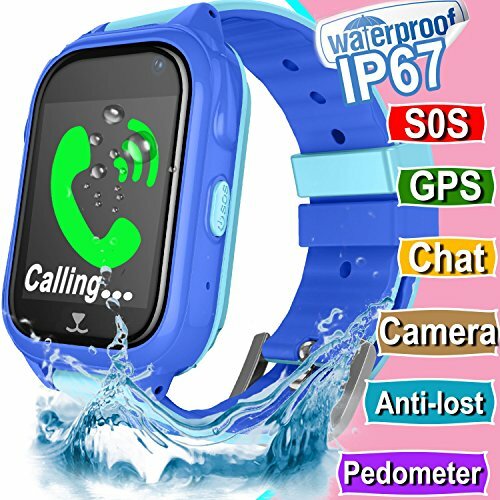 When in distress, your kid can use this smart watches fast dial to inform you, thanks to an intuitive SOS feature. This is so important in an emergency situation. ✅ Game Watch For Boys Girls: The children can play through the touch screen and select the puzzle games, help to improve the intelligent of the child, increase sensitivity to numbers, exercise their ability to respond, logical thinking and hand-eye coordination, let the children enjoy the learning fun anytime, anywhere. Best choice for kids.